But how does the notion of a national collection representing Britain – perhaps even a discourse of 'Britishness' – fit with a 21st-century idea of identity? Post-Empire migration, the European project, globalisation and the rise of digital media have all challenged the nation-state as the default system of belonging. It's change like this that social scientists at London South Bank University's School of Law and Social Sciences thrive on. 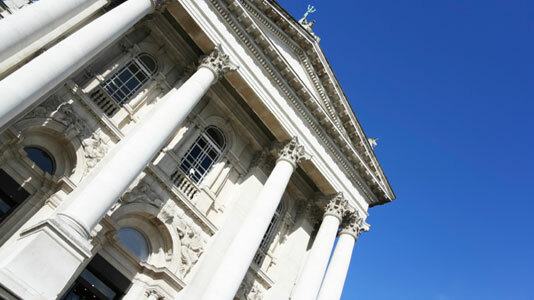 Seeking to pursue questions of audience and cultural identity, Tate Britain partnered with LSBU and the University of the Arts, London, in 2007 for an extended research project into the ways in which the Tate understands its audiences and the challenges of contemporary cultural diversity. "At its most simplistic, Tate Encounters sought to address why - despite a significant increase in museum attendance (supported by free access) and targeted education programmes – visits by minority audiences remained low," explains Andrew Dewdney, professor of media education at LSBU and principal investigator of Tate Encounters. Funded by the Arts and Humanities Research Council, the embedded project sought to provide an in-depth account and analysis of a sustained encounter between those of a migrant family background and Tate Britain as a national cultural site. From 2007 to 2009, fieldwork generated a body of material from which the research team could analyse the ways in which the Tate understood and related to its audiences. During the fieldwork period the project enlisted the participation of more than 600 first-year LSBU undergraduates - drawn from largely migrational and non-traditional educational backgrounds who visited Tate Britain and responded to their encounter through questionnaires and essays. A group of 12 students subsequently took part in an in-depth, two-year study working with a visual anthropologist and were constituted by the project as 'co-researchers'. "Undergraduate students are not normally thought of as being in a position to undertake original research," says Professor Dewdney. "So this was a unique opportunity for them. Participants were invited, after a three-month pilot, to become 'co-researchers' through the submission of a proposal which was discussed and signed-off with the research team." The co-researchers used digital media to document their work and final productions were screened as part of 'Research in Process', a month-long programme at the Tate. Bringing together 72 contributors including artists, curators, educators and policy-makers, the LSBU students gained invaluable experience in undertaking research fieldwork - enhancing their employability and prospects of postgraduate study. In tracing their encounter with Tate Britain, and following their own accounts of what Tate Britain meant in their daily lives outside of the museum environment, a complex account emerges of how intertwined the issues of identity and nationalism are with new forms of migration and globalisation. "Multiculturalism, as politically received and as policy, has reproduced a mythologised view of a British majority," says Professor Dewdney. "Which under any sustained scrutiny dissolves into a multitude of other groupings based upon historical circumstances, region, locale and socio-economic positions." Professor Dewdney argues instead of thinking about cultural diversity in Britain in terms of a 'multicultural' society, the research points to a new direction of thinking about British culture as 'transcultural'. "Transculturality understands cultural value as being constantly in flux as people move across boundaries and borders of all kinds. To think of British culture as transcultural provides a starting point for new narratives of British cultural history and memory, which make more sense of the mobile conditions of the present. "The final Tate Encounters report is of direct use to policy makers, opinion formers and stakeholders in the sector when considering future cultural diversity policy and funding initiatives." To find out more about this work, contact Andrew Dewdney or search our People Finder for academics researching in this area.